Celkon mobiles have launched their Signature A119 HD earlier this year but as almost each and every company have their Quad core devices in the market Celkon have finally decided to launched their first Quad core phone the A119Q Signature HD. The boasts a 5 inch 720p HD display like the A116 Superfone Canvas HD the recently launched Zen Utraphone. The phone also has a 12 MP camera (with 1080p recording we guess) and the camera in the front is 3.2 MP which will possibly support video calling and Skype chat. It will come with Android 4.2 Jelly Bean out of the box. For a good deal Celkon has also packed in a free flip cover with this phone. 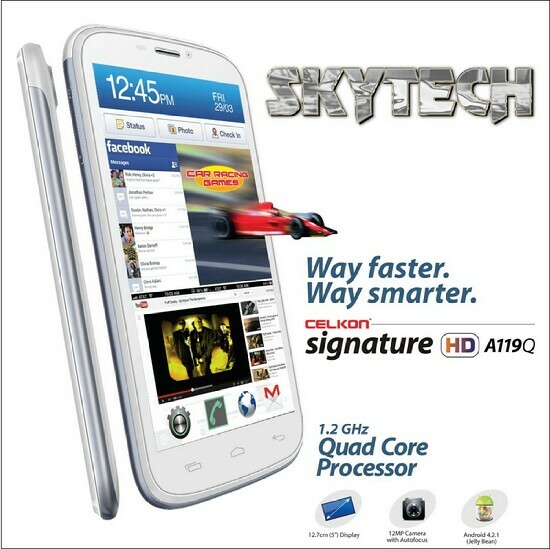 The Celkon Signature HD A119Q is priced very competitivly at Rs. 12,499 along with a free flip cover worth Rs. 1,500.